This code of conduct has been devised for the safety and benefit of the club and its members and outlines the minimum standards expected on all rides. Riders participating in club runs must join the group appropriate to their ability and restrict their ride to the parameters of the group and instructions of the ride leader. Each group should remain within an appropriate size of 8 – 10 riders to prevent obstructing the road and to enable other road users to go about their business. The wearing of cycle helmets is compulsory on all club rides. The default riding mode will be a compact group of two lines i.e. two abreast – Why Ride Two Abreast? Read this for an explanation. Never ride more than two abreast unless overtaking (providing it is safe to do so). Club rides are social rides not races and members are expected to treat them appropriately. Listen to and follow the instructions given by the ride leader, particularly the instruction to “double up” or “single out”. Be proactive by thanking motorists for courtesy – we need a charm offensive to win them over. Behave in a manner that represents the club and cyclists in a good light. This includes (when necessary) answering the call of nature in a discreet manner, out of sight of passers-by, overlooking houses etc, and not in a manner likely to lead to complaints. Take responsibility for your own health and safety at all times, it is not the responsibility of the club or ride leaders. New riders and those changing groups must inform the ride leader of their abilities and presence so he or she is aware. Respect the speed of the group and do not try to push the group faster or split it. Please help the club’s promotional efforts by wearing club kit wherever possible. Be aware of riders behind you. Ride smoothly and do not brake without warning if it can be avoided. Never overlap wheels with the rider in front of you. Shout warnings and give hand signals to other riders if there is a danger in the road, see Group Communication. Do not accelerate out of junctions or roundabouts but ride smoothly and check that the group has safely negotiated the junction and is intact before accelerating. Should the group be split, riders should slow down or find a safe place to stop and re-group before proceeding. The group should always assist any of its riders suffering from mechanical or physical problems but always find a safe place to stop and re-group before proceeding to help. The group should always wait for the last rider unless the rider has requested to be left. Never leave the group without first notifying the ride leader. Always be aware of who the rider behind you is. 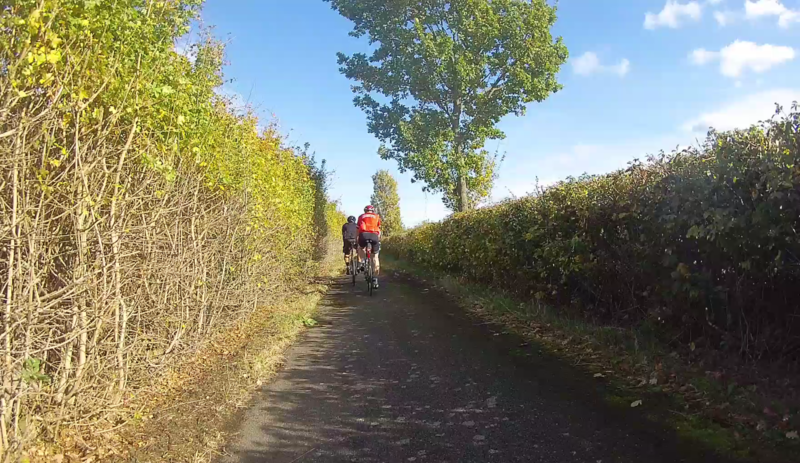 The key to a successful club run is good communication between and with other riders and the ride leader. Cycle Helmets are compulsory for all club rides. To ensure that mechanical problems are minimised, riders must keep their bikes in a roadworthy condition. All riders should carry sufficient and appropriate equipment to enable them to complete the ride in a satisfactory manner without putting a burden on fellow riders. 1. Always display a rear light, irrespective of weather conditions, to aid rider visibility by other road users. 2. Appropriate clothing for the weather. 3. Mudguards should be used during the winter months of October to March and in wet weather. 4. Appropriate tyres to minimise risk of punctures. 5. Sufficient food to keep you energised. 7. Pump or other means of inflating tyres. 8. Two spare inner tubes. 10. Allen keys or multi-tool appropriate to your cycle. 12. Sufficient money for cafe stops or emergencies (e.g. taxi home in case of unfixable mechanical problem). 1. Inappropriate cycles for the ride or weather. 2. Aero bars – please do not use them whilst riding in the group. TT bikes where the brakes are on the end of the horns are not permitted for safety reasons. Clip-on aero bars are ok as long as they’re not actually used on the ride, as per item 2 above. If you are not confident of finishing the ride or your bike has a mechanical problem, let other riders know as soon as possible. The ride leader and the group will do all they can to assist you, but they can only do so if they are aware of your problem. The group will always be supportive. New Riders – Do not be fazed by worries about repairing punctures as the group will always provide help, nor requesting comfort breaks as the group will wait for you at the next safe place to pull over (but you must always let them know). The club does not provide first aid cover or medical support for riders on club runs. In the event of an accident, the Ride Leader and the group will do all they can to assist any rider who has suffered injury or medical emergency. Riders who have pre-existing medical conditions that require special treatment must take precautions to ensure that information about their condition can be easily found by the emergency services or other medical professionals in the event of an accident or the onset of a medical episode. If a rider has a condition that might manifest itself during a club run then they must inform another rider or the Ride Leader. The rider will need to make that judgement and be responsible for themselves. The above is simply a guide to riders, especially new ones. They are designed to make the ride more fun and to not burden other club members. Please note that it is the responsibility of all riders to assist the designated leader to make the rides as simple and safe as possible. Taking part in a club ride involves a specific commitment from every rider to ride within the parameters set out, and the instructions given, by the Ride Leader, a simple commitment well within the capability of everyone. For the sake of clarity, although the club sincerely hopes this will never be the case, the Ride Leader is specifically authorised by the committee to inform anyone consistently not honouring that commitment that they are no longer welcome on that ride.